Yesterday Isabell, Margaret, Bill and I met up at Jean’s house to begin the long task of cleaning and sorting. This Friday it will be two months since she died, and I have a feeling that I have only begun the process of missing her. Jean is Bill’s mother, so technically she was my ex-mother-in-law, but that hardly describes the relationship that actually grew deeper after Bill and I separated and then divorced, and deeper again as Jean began to need more help. It was nice being in the living room yesterday morning with the fall sunshine coming through the windows and Jean’s things all around; even though we had come up to work we spent almost an hour sitting and talking and catching up with each other’s lives. We didn’t talk much about Jean. There doesn’t seem to be much left to say. It feels as though this whole summer was dedicated to the process of Jean’s dying, and to the mystery of death. Jean’s death was her choice: a few days after her 87th birthday she admitted that she had developed a bedsore, and that it had become infected; in consultation with her doctor she decided to keep the wound cleaned and dressed, and do whatever was necessary to manage the pain, but not take any antibiotics. 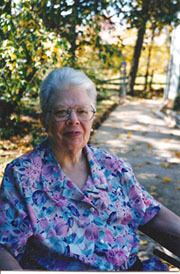 “I feel as though my body has given me an opportunity,” she said, “and I’m going to take it.” It took a little less than a month for the infection to overwhelm her, but in that month we all were able to finish any unfinished business we had with Jean, to talk to her, and after the pain got too intense and the morphine began, just to sit with her and hold her hand. The world feels very alive this morning. It’s Sunday and the house is quiet, but with autumn here it’s cool enough to keep the windows open. The chickens are making busy noises in their pen; birds call in the distance against the barely audible sizz-sizz-sizz of late season insects. Down the hill a train passes the crossing with a long low wail. I really honestly didn’t know what I was going to do. All week I had a sleepy, inward-turning sort of feeling of being swept towards something I couldn’t predict or control, but I didn’t know what I was going to do. The Sunday afternoon after I sent out the email Bill, Margaret, Isabell, Isabell’s partner Nego, and I got together at a coffee shop to talk about Jean. She was growing weaker and needed more help with everyday things; we met to work out a new visitation schedule. After the meeting Isabell, Nego and I stayed on to finish our cups of tea. “I don’t know why I assumed, Mom, when I read that email that you meant you were going to go out into the street,” Isabell said. “I’m actually kind of relieved,” Isabell said. “But still…” It was Nego. Isabell and I looked at her. “I mean when is it the right time for civil disobedience? When is enough enough?” There was a long silence. Finally Isabell laughed and got that mischief-making look in her eyes that I remember from when she was small. “I will if you will,” she said. So we agreed that when the moment came we would all step off the sidewalk and go into the street. Ian is not a troop. The men I know from Food Not Bombs still struggling with the demons they brought home from Vietnam forty years ago are not troops. Jean’s father, damaged forever by his experiences as a medical aide in the First World War, driven inward and away from his family, was not a troop. My friend Nancy’s son Max, the same age as Margaret, who did a tour of duty in Iraq is not a troop. 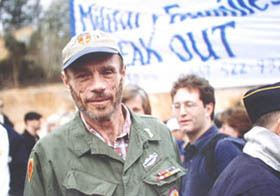 David Cline, a tireless anti-war organizer and Vietnam vet who died two weeks ago, was not a troop. I met Dave in March of 2005 when I was helping with a big antiwar rally in Fayetteville, NC; I’m not even sure we actually met, but the urgency of his presence and the power of his haunted, ravaged face left me feeling as though we had had an unforgettable conversation. After their expressions of shock and amazement Jean told me she was proud of me. She shook her head and said: “I think you’re crazy, but I’m proud of you.” Then Hermena spoke. I had forgotten that her son was in the Marines, awaiting orders. As soon as I remembered I wished I hadn’t said anything, I wished I hadn’t talked about the meaning of the word “troop.” Hermena closed he refrigerator forcefully and turned. And so I did. Nine of us were arrested that day. Isabell and I were arrested together. That was on January 11; it’s now the last day of September. In those months 800 more American military people and close to 20,000 Iraqis have died, and Barack Obama, Hillary Clinton, and John Edwards all say that if one of them becomes president we will probably still have troops in Iraq in 2013. On the other hand, I heard from Ian recently that he is back in Boston busy forming a chapter of Iraq Veterans Against the War. Max is back home safe and has just started college. Hermena’s son is still over there. Probably we have never met, although I was in Fayetteville in 2005 also. I just wanted to say that I found your blog today very touching, it made me cry, although many things seem to these days. I ran across it because I have a news alert for things that mention IVAW. I’m proud of you for standing out in that street, even though it did not keep more soldiers from being sent to Iraq, we have to do what we do anyway. I’m sure this meant a lot to Hermena as well, even though it didn’t keep her son out of Iraq. I also appreciate the mention of Dave, a great loss, someone who has been important to me throughout this war. My son Cody was in Iraq the first year. Well said, you write beautifully, thank you for sharing it with the rest of us.